Markosite is a 3/4 Peruvian male with a wonderful disposition and regal stature. His fiber qualities are quite notable, exhibiting density, crimp and a very nice hand. 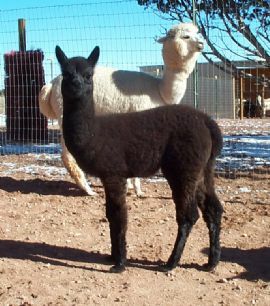 Markosite is out of strong black/dark color bloodlines so we would expect him to pass on the color when he's ready to breed. Markosite could very well grow into a great herd sire - we are anxious to see how he matures.